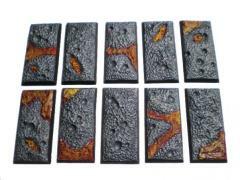 These quality fire and brimstone 25mm x 50mm resin calvary bases create a volcanic wasteland environment. Each base is unique with different scenic elements such as flowing lava, volcanic rock, and flames flickering out of fissures in the rock. This item includes 10 unique 25mm x 50mm fire and brimstone calvary bases. As with all of ForgeCraft Games resin parts, these 25mm x 50mm resin bases are precision pressure cast for void free castings.